Development is an ongoing concern in our community, and we are living through a period of major transformation. 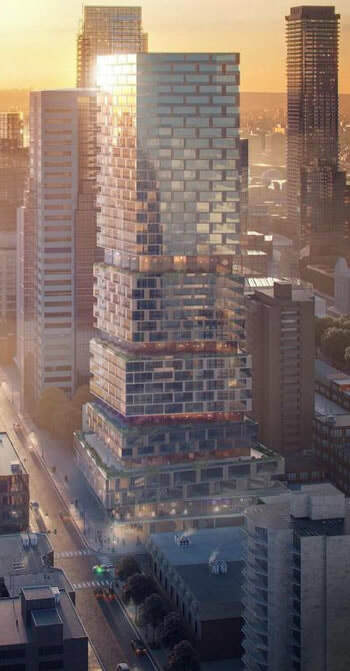 Check out our Interactive Map for details on specific developments, or see our page dedicated to the Church Wellesley NW Tower. Will our city infrastructure keep up with the pace? How are our elected officials and city planning department responding to this unprecedented densification? As the voice of the community, the CWNA is committed to ensuring that the Church Wellesley neighbourhood remains healthy, vibrant and sustainable. The CWNA Development Committee keeps on top of building development applications. We meet with developers, city planners and elected officials to help guide responsible development in our neighbourhood. We take part in hearings of the Local Planning Appeal Tribunal (previously the Ontario Municipal Board) to represent the interests of our community. View looking west to ONE Development's proposed 37-storey tower at NW corner of Church and Wellesley. ​Responsible development should recognize and contribute to our distinctive urban village. Church Street is our village main street and independent small businesses shape its unique character. Trees shade its sidestreets and green spaces dot the area. Our neighbourhood is open and welcoming to all. ​• ensure that cars, bikes and pedestrians can safely share streets. Responsible development should build on what makes Yonge Street important for so many Torontonians. It should protect and restore the 19th-century buildings that line the street. Cabbagetown, the Distillery District and the St. Lawrence neighbourhood have found ways to use their heritage for the benefit of all. Now is our chance to build Great Yonge Street between Dundas and Yorkville. ​• public areas remain open and well-lit to keep them safe. As a part of the YongeTOmorrow project, the City is currently undertaking an Environmental Assessment of Yonge Street, between Dundas and Bloor Streets. The CWNA is a member of the Stakeholder Advisory Group which will provide advice, feedback and guidance during the Environmental Assessment study process. The CWNA is always working to assure that the needs of the community are taken into consideration within the City planning and development approval process. ​Our interactive map, created with Google Maps, will help you keep up with the many development projects in our neighbourhood, both those under construction and those in various stages of the approval process.